I can’t believe it’s July already!! July is our anniversary month, and I’m so excited to celebrate with you all. I have lots planned, so make sure to check out the sales regularly, as I will have a few pop-up sales for great deals! Anniversary – Saturday, July 28 : We’re going to have a Roll to Win day! Roll the dice at the checkout for chances of up to 35% off your purchase, or possibly free yarn!! There will be cake, coffee, and tea, and I hope you’ll all come out to visit. What a year it’s been!! PLAYING WITH STRING YARN CRAWL! Once again, I am so excited to be part of the Playing With String Great Northwest Yarn Crawl and Fibre Fest!! The Crawl goes until September 9th, and ends in a fabulous fibre fest in Prince George on the 16th of September, which includes door prizes, workshops, demos, and a fashion show. Each stamped page of your Passport gets you extra chances to win. To join in, just come on in to any participating yarn store and pick up a passport. Get your passport stamped at each location, and take advantage of the special store coupons on the bottom of the booklet page at each participating shop. We’ll have 10% off one purchase coupon for us! Can’t wait to see everyone swing through! 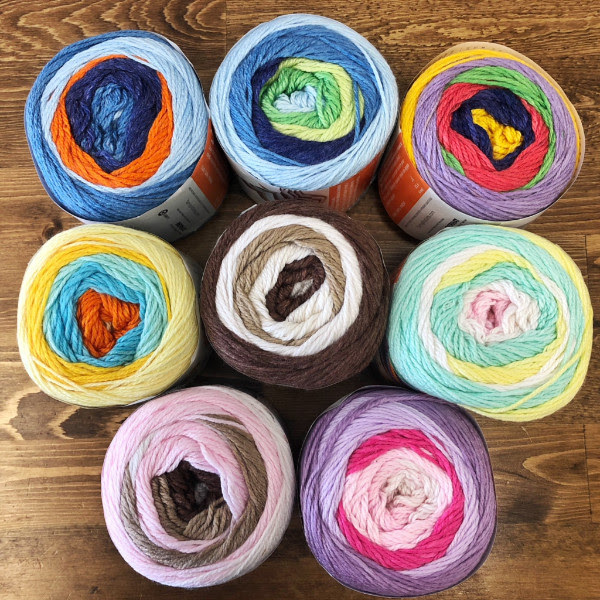 This past month, we’ve only had one new yarn, Bernat’s Softee Baby Stripes – a 120g super soft, DK weight cake yarn that automatically stripes through 5 different colours. It’s so soft and shiny! We’ve received plenty of new colours for existing yarns and have a few new yarns coming (a bamboo/cotton and some Regia sock yarns!) later this month, so be sure to pop back in and have a look! Having problems with reading a pattern? Can’t remember how to fix a mistake in your knitting? 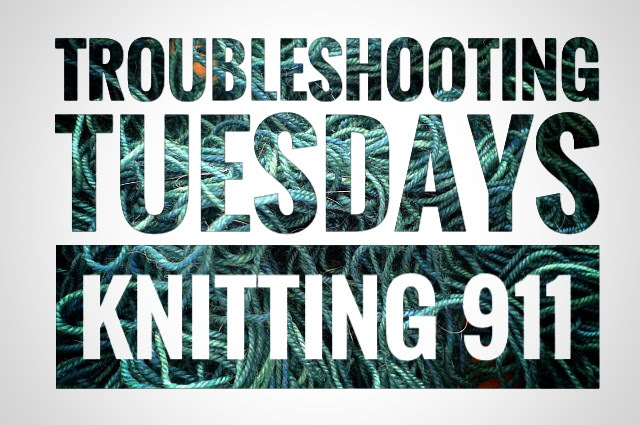 Every other Tuesday, our knitting guru, Helen, will be available from 1 to 3pm for our free drop-in Knitting 911 at the shop. Bring in your project or questions on July 10th. Every Wednesday at 1pm, we have a stitchy get together right here in the shop. Bring your current WIP (work in progress) and come visit over coffee or tea! Magic Loop Knitting – How to cast on a single or double item on one long circular. I know what people say, but truuuuust me! Magic Loop is so easy! We will be learning to cast on and work a magic loop with both one and two at a time items on a long circular needle. No specific project to work on (unless you’d like to cast on socks or another project – remember to bring your yarn and pattern!). Basic knitting skills are required (long tail cast on/knit/purl). Supplies: Yarn and a 40″ circular needle to match the yarn weight. Required to know basic cast on, knit and purl, as well as cast off. Supplies: One skein Black Cat DK weight yarn (280 yards) or similar weight yarn , 4mm 32″ or 40″ circular needle, and wool needle to weave in ends. Gauge Swatches! What are they for and why on Earth would I ever want to make one?? Look, I know you are excited to knit and just want to dig into your new project…but I promise – gauge swatches are super important!! Learn to take the time to swatch and why it can really up your knitting game. You don’t have to be the person who knits a sweater that will only fit giants. This will teach you how to make a swatch, how to fix incorrect gauge, and when you really don’t need to knit a gauge. Bonus: simple blocking is also explained!! Have questions or need instruction that will take longer than 15 minutes or so? Private lessons can be scheduled, dependent on teacher availability, for $29/hour. Let’s talk about cotton! Specifically, Cascade’s Ultra Pima DK…a beautiful, mercerized cotton garment yarn that works up soft and shiny. It’s amazing! The colours are vivid and the yarn is machine washable. It’s perfect for summer projects! Ein Tag am Meer, by Corrina Tengler – a quick-knit stripy sleeveless top that is perfect to show off Cascade’s lovely colors. Vanier T-Tunic, by Jennifer Ozses – a lacy crocheted tunic with a deep v back. French Macaroon, by The Noble Thread – an adorable easy garter knit sweater for babies and toddlers. 82-6a Crocheted Cardigan, by Drops Design – a Summery, mesh crocheted cardigan (and there is also a mesh tank design to match) available on Drops website. 167-6 Woodstock, by Drops Design – a fluttery knit tank with an allover-back lace design. Available on the Drops website. The Best Mermaid Tail, by Elizabeth Seeley – an adorable crocheted mermaid tail that can be made in any size. So many patterns are available for free! 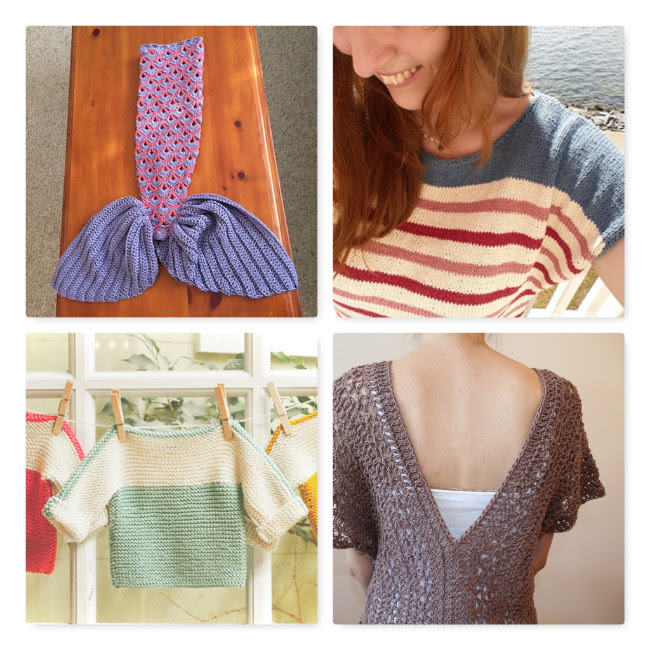 Be sure to search on Ravelry or your favorite pattern archive for awesome summer projects.